1 A None No Power Seat 1 A is a standard Business Class seat whose proximity to the lavatories and galleys may be bothersome. 1 D None No Power Seat 1 D is a standard Business Class seat whose proximity to the lavatories and galleys may be bothersome. 1 G None No Power Seat 1 G is a standard Business Class seat whose proximity to the lavatories and galleys may be bothersome. 1 K None No Power Seat 1 K is a standard Business Class seat whose proximity to the lavatories and galleys may be bothersome. 12 A None No Power Seat 12 A is a standard Premium Economy Class seat whose proximity to the lavatories and galleys may be bothersome. 12 C None No Power Seat 12 C is a standard Premium Economy Class seat whose proximity to the lavatories and galleys may be bothersome. 12 D None No Power Seat 12 D is a standard Premium Economy Class seat whose proximity to the lavatories and galleys may be bothersome. 12 E None No Power Seat 12 E is a standard Premium Economy Class seat whose proximity to the lavatories and galleys may be bothersome. 12 F None No Power Seat 12 F is a standard Premium Economy Class seat whose proximity to the lavatories and galleys may be bothersome. 12 G None No Power Seat 12 G is a standard Premium Economy Class seat whose proximity to the lavatories and galleys may be bothersome. 12 H None No Power Seat 12 H is a standard Premium Economy Class seat whose proximity to the lavatories and galleys may be bothersome. 12 K None No Power Seat 12 K is a standard Premium Economy Class seat whose proximity to the lavatories and galleys may be bothersome. 13 F None No Power Seat 13 F is a standard Premium Economy Class seat. 14 A None No Power Seat 14 A is a standard Premium Economy Class seat that has limited recline. 14 C None No Power Seat 14 C is a standard Premium Economy Class seat that has limited recline. 14 D None No Power Seat 14 D is a standard Premium Economy Class seat that has limited recline. 14 E None No Power Seat 14 E is a standard Premium Economy Class seat that has limited recline. 14 F None No Power Seat 14 F is a standard Premium Economy Class seat that has limited recline. 14 G None No Power Seat 14 G is a standard Premium Economy Class seat that has limited recline. 14 H None No Power Seat 14 H is a standard Premium Economy Class seat that has limited recline. 14 K None No Power Seat 14 K is a standard Premium Economy Class seat that has limited recline. 18 A None No Power Seat 18 A is a standard Economy Class seat with extra legroom. 18 B None No Power Seat 18 B is a standard Economy Class seat with extra legroom. 18 C None No Power Seat 18 C is a standard Economy Class seat with extra legroom. 18 D None No Power Seat 18 D is a standard Economy Class seat with extra legroom. 18 E None No Power Seat 18 E is a standard Economy Class seat with extra legroom. 18 F None No Power Seat 18 F is a standard Economy Class seat with extra legroom. 18 G None No Power Seat 18 G is a standard Economy Class seat with extra legroom. 18 H None No Power Seat 18 H is a standard Economy Class seat with extra legroom. 18 J None No Power Seat 18 J is a standard Economy Class seat with extra legroom. 18 K None No Power Seat 18 K is a standard Economy Class seat with extra legroom. 20 A None No Power Seat 20 A is a standard Economy Class seat that is missing a window. 20 K None No Power Seat 20 K is a standard Economy Class seat that is missing a window. 25 A None No Power Seat 25 A is a standard Economy Class seat that is missing a window. 25 K None No Power Seat 25 K is a standard Economy Class seat that is missing a window. 29 A None No Power Seat 29 A is a standard Economy seat whose proximity to the lavatories may be bothersome. 29 B None No Power Seat 29 B is a standard Economy seat whose proximity to the lavatories may be bothersome. 29 C None No Power Seat 29 C is a standard Economy seat whose proximity to the lavatories may be bothersome. 29 D None No Power Seat 29 D is a standard Economy seat whose proximity to the lavatories may be bothersome. 29 E None No Power Seat 29 E is a standard Economy seat whose proximity to the lavatories may be bothersome. 29 F None No Power Seat 29 F is a standard Economy seat whose proximity to the lavatories may be bothersome. 29 G None No Power Seat 29 G is a standard Economy seat whose proximity to the lavatories may be bothersome. 29 H None No Power Seat 29 H is a standard Economy seat whose proximity to the lavatories may be bothersome. 29 J None No Power Seat 29 J is a standard Economy seat whose proximity to the lavatories may be bothersome. 29 K None No Power Seat 29 K is a standard Economy seat whose proximity to the lavatories may be bothersome. 31 A None No Power Seat 31 A is a standard Economy seat with extra legroom due to the Exit Row, however, the proximity to the lavatories may be bothersome. 31 B None No Power Seat 31 B is a standard Economy seat with extra legroom due to the Exit Row, however, the proximity to the lavatories may be bothersome. 31 C None No Power Seat 31 C is a standard Economy seat with extra legroom due to the Exit Row, however, the proximity to the lavatories may be bothersome. 31 D None No Power Seat 31 D is a standard Economy seat with extra legroom due to the Exit Row, however, the proximity to the lavatories may be bothersome. 31 E None No Power Seat 31 E is a standard Economy seat with extra legroom due to the Exit Row, however, the proximity to the lavatories may be bothersome. 31 F None No Power Seat 31 F is a standard Economy seat with extra legroom due to the Exit Row, however, the proximity to the lavatories may be bothersome. 31 G None No Power Seat 31 G is a standard Economy seat with extra legroom due to the Exit Row, however, the proximity to the lavatories may be bothersome. 31 H None No Power Seat 31 H is a standard Economy seat with extra legroom due to the Exit Row, however, the proximity to the lavatories may be bothersome. 31 J None No Power Seat 31 J is a standard Economy seat with extra legroom due to the Exit Row, however, the proximity to the lavatories may be bothersome. 31 K None No Power Seat 31 K is a standard Economy seat with extra legroom due to the Exit Row, however, the proximity to the lavatories may be bothersome. 43 F None No Power Seat 43 F is a standard Economy seat. 45 A None No Power Seat 45 A is a standard Economy seat whose proximity to the lavatories may be bothersome. 45 B None No Power Seat 45 B is a standard Economy seat whose proximity to the lavatories may be bothersome. 45 C None No Power Seat 45 C is a standard Economy seat whose proximity to the lavatories may be bothersome. 45 D None No Power Seat 45 D is a standard Economy seat whose proximity to the lavatories may be bothersome. 45 E None No Power Seat 45 E is a standard Economy seat whose proximity to the lavatories may be bothersome. 45 F None No Power Seat 45 F is a standard Economy seat whose proximity to the lavatories may be bothersome. 45 G None No Power Seat 45 G is a standard Economy seat whose proximity to the lavatories may be bothersome. 45 H None No Power Seat 45 H is a standard Economy seat whose proximity to the lavatories may be bothersome. 45 J None No Power Seat 45 J is a standard Economy seat whose proximity to the lavatories may be bothersome. 45 K None No Power Seat 45 K is a standard Economy seat whose proximity to the lavatories may be bothersome. 50 A None No Power Seat 50 A is a standard Economy seat with extra legroom due to the Exit Row, however, the proximity to the lavatories may be bothersome. 50 B None No Power Seat 50 B is a standard Economy seat with extra legroom due to the Exit Row, however, the proximity to the lavatories may be bothersome. 50 C None No Power Seat 50 C is a standard Economy seat with extra legroom due to the Exit Row, however, the proximity to the lavatories may be bothersome. 50 D None No Power Seat 50 D is a standard Economy seat with extra legroom due to the Exit Row, however, the proximity to the lavatories may be bothersome. 50 E None No Power Seat 50 E is a standard Economy seat with extra legroom due to the Exit Row, however, the proximity to the lavatories may be bothersome. 50 F None No Power Seat 50 F is a standard Economy seat with extra legroom due to the Exit Row, however, the proximity to the lavatories may be bothersome. 50 G None No Power Seat 50 G is a standard Economy seat with extra legroom due to the Exit Row, however, the proximity to the lavatories may be bothersome. 50 H None No Power Seat 50 H is a standard Economy seat with extra legroom due to the Exit Row, however, the proximity to the lavatories may be bothersome. 50 J None No Power Seat 50 J is a standard Economy seat with extra legroom due to the Exit Row, however, the proximity to the lavatories may be bothersome. 50 K None No Power Seat 50 K is a standard Economy seat with extra legroom due to the Exit Row, however, the proximity to the lavatories may be bothersome. 59 C None No Power Seat 59 C is a standard Economy seat that juts out into the aisle and may be bumped by crew and fellow flyers. 59 H None No Power Seat 59 H is a standard Economy seat that juts out into the aisle and may be bumped by crew and fellow flyers. 62 A None No Power Seat 62 A is a standard Economy seat with limited recline and whose proximity to the galleys may be bothersome. 62 C None No Power Seat 62 C is a standard Economy seat with limited recline and whose proximity to the galleys may be bothersome. 62 D None No Power Seat 62 D is a standard Economy seat whose proximity to the galleys may be bothersome. 62 G None No Power Seat 62 G is a standard Economy seat whose proximity to the galleys may be bothersome. 62 J None No Power Seat 62 J is a standard Economy seat with limited recline and whose proximity to the galleys may be bothersome. 62 K None No Power Seat 62 K is a standard Economy seat with limited recline and whose proximity to the galleys may be bothersome. 63 D None No Power Seat 63 D is a standard Economy seat with limited recline and whose proximity to the galleys may be bothersome. 63 E None No Power Seat 63 E is a standard Economy seat with limited recline and whose proximity to the galleys may be bothersome. 63 F None No Power Seat 63 F is a standard Economy seat with limited recline and whose proximity to the galleys may be bothersome. 63 G None No Power Seat 63 G is a standard Economy seat with limited recline and whose proximity to the galleys may be bothersome. although extra legroom get, the trolley in the aisle can hit your leg at this seat directly and easily. Not recommended. Flew from HND to YYZ. 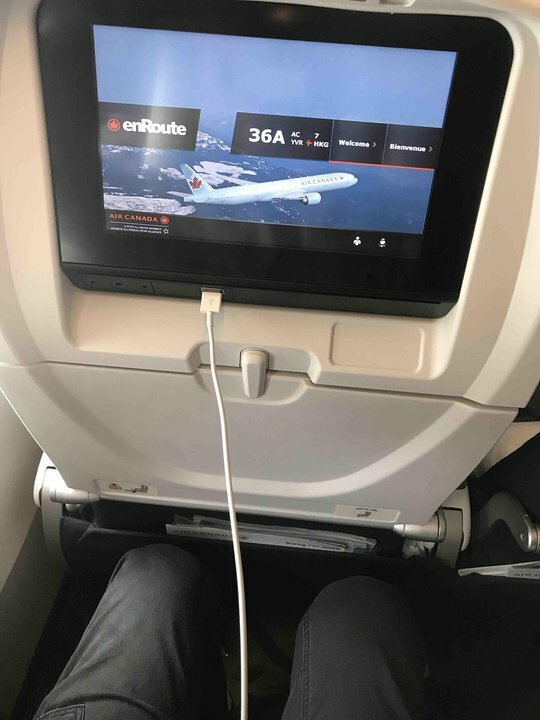 Probably the best seat in Economy, especially if travelling as a couple. No third person beside you, there is extra room between the seat and the wall so you can store stuff or stretch your arm. Also can stand up without blocking isle. Don't fly it. The plane has 3-4-3 seating in a row. If you have larger size people next to you, you are in the sardin can. Row 40 does not have arm rests that lift up. This may be fine for most travelers, but those with small children might find this difficult. The fact that the arm rest did not lift up meant that my toddler could not rest on my lap and stretch out on the other seat, making it very difficult to get them to sleep. It's a very small and cramped little nook on the air plane. I spent the extra $ to book a emergency exit row, and this time I regretted. There's no windows but tons of leg room. Also, there's absolutely no space to stow away your personal item bag. I was also on the plane with another man who was tall and large build which also made it uncomfortable for both of us. There are tons of people constantly coming in and out and wiating in front of you to use the washroom, so it also disruptive. Wouldn't recommend this seat if you are trying to catch some sleep. The pillar for the seats in front is quite wide and reduces leg space for those behind. My left foot was very squashed. Economy seats on this plane are in general VERY narrow. Okay for short haul, but totally unacceptable for a long haul flight. Will ask my company not to book this flight with Air Canada again. Lots of leg room. No place to store your "carry-on-personal-item", it has to go in the overhead bin which was full. So goodbye personal items. This aircraft has 3-4-3 seating in this row. I managed to get a two seat row on a previous flight. The aircraft seemed to be nose-up at altitude. I could not get my hip comfortable. I flew YVR to YYZ yesterday. I still have a cramp in my thigh( I'm 75 but not decrepit). I was more comfortable in Westjet premium economy on the way out. ( YYz to YVR) . I had an AC wrap for lunch which was awful. Flew between NRT and YYZ (both ways) at 13C of this aircraft. Sufficient space and good food. But one thing bad about AC's premium economy is that unlike other airlines, seats don't have legrests. We flew LHR-YVR on this aircraft and were fortunate to have a whole row of 4 seats between the two of us, allowing us to spread out. If the row had been full, my companion in 61F would have been very squashed as the seats are quite narrow. The in-flight service was much better than I expected it to be - full meal departing LHR, mid-flight snack and ice-cream, then hot snack before arrival in YVR. Squished in like a sardine. Other version is 2 seats, much better, so avoid this aircraft. Both seats 20A and 20K have no window! It's impossible to see outside without looking back through the window in row 21. I chose my seat after a review of the seat map here and I really think it's should be yellow for the outer seats or worst red for the window seats where travelers expect to have windows. I flew from Toronto to LHR. Be aware, the foot room underneath the seat in front is greatly reduced in height, leaving only about 6-8 inches. My travel tote which normally fits under all seats, would not fit. The middle and window seats do not have this issue. Flew Vancouver to Sydney (return) in business. 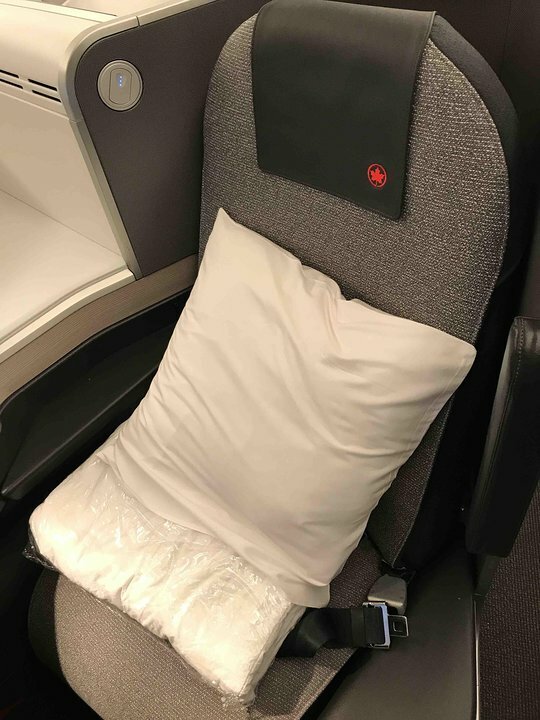 Air Canada's new business class seats are awful. Lie flat seats are not even and not flat. I am 5'10" and I just fit; if you are taller, you cannot stretch out. But, most frustrating.... the fixed non-movable table means you cannot turn over or bend your legs to get more comfortable. They must get rid of that table for me to ever fly them again in an overnight flight. That said, food great, service great, entertainment OK. But back to the drawing board on bed/table, please. Leg room from 50 A does have some obstruction from the exit door, but at 6'2 I could still streach out. Being tall, I felt the curve of the side of the plane made it uncomforable to lean against the wall. Always lots of people standing infront of these seats either waiting for restroom or just standing. Row 18 A B C & H J K are fantastic seats if you require extra legroom. There is no bulkhead or even a curtain. You look onto the back of Premium Economy seats. Even if those infront recline, still plenty of space. You can view outside from a choice of 3 windows! While there is tonnes of leg-room, this not an enjoyable spot. The exit curves in so your movement is restricted. There is no window, as the exit door is several feet ahead of you. And worst of all....passengers using the toilet all stand in your space like they are waiting for a bus. Won't sit here again. For 77W ver 2, The side rows of Premium Economy (14A/C/H/K) are very poorly designed with recline severely limited by the wall behind. For the middle seats (14D/E/F/G), there is more recline space to the wall. When the seat in front reclines, it feels very claustrophobic and forget about trying to pick up anything below, since even untying your shoelace can be very difficult. On this plane, the first row of seats has more leg space than I've seen on other Premium Econ on AC. This is the first time I've noticed the recline in the last row so poor, and I've sat in 14K many times on other AC planes. Note that this seat has the large (full size) exit door bulge that does steal leg room from the left leg. Other side of aircraft has bulk head. Trying to add photo, though I do not see an option for that here. there is no space to keep anything that you may want handy on a flight, like your personal bag with your documents. the seat is tight, felt like I was in a casket in a straight position. small seat, narrow, short, poor support. the crew used the "space" as their holding area for cabin trolleys n people would stand around u waiting for the lavatory. no fun. i'm over 6' tall. Awful!! 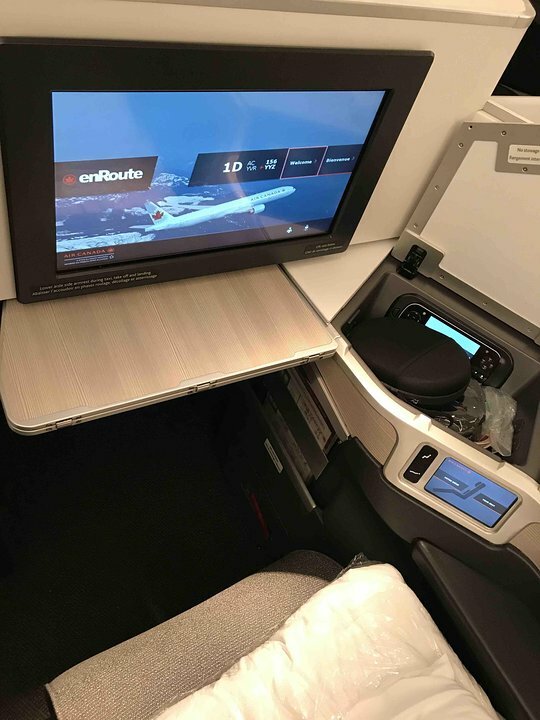 This flight was 12 hours from Tokyo direct to Toronto. Seats VERY narrow and limited leg room. My legs in 34B kept going numb due to the uncomfortable angle of the seats. The tray was slightly larger than my iPad and impossibly small food trays left no room to put your drink (tray completely covered the tray's beverage indent). When passenger in front reclined, tray was on an angle. We will never again fly on this aircraft! I am 6'5" tall, and these biz class seats are too short for lie-flat seating. Besides being too short, they taper uncomfortably at the feet, which reminds me of squeezing into a test tube or a mummy sleeping bag. For mostly-reclined seating the seat is OK, although the bottom cushion is too thin and I could feel the hard support beneath it. Lack of lumbar support, while true, didn't bother me too much. On the plus side, the light in the foot well is thoughtful, and I found the other lighting more than adequate. A dimmer control for the bright reading light would be good. The storage space for small stuff was very good. Seat is somewhat comfortable and still felt I had enough space when the person in front reclined. However, I would most definitely not like to experience this HD layout (3x4x3) long-haul. I saw passengers of a much bigger build than me, and they were squished like sardines; very little/no room to manoeuvre EXCEPT if you have an aisle seat; one side open for a little extra elbow room/leg room. 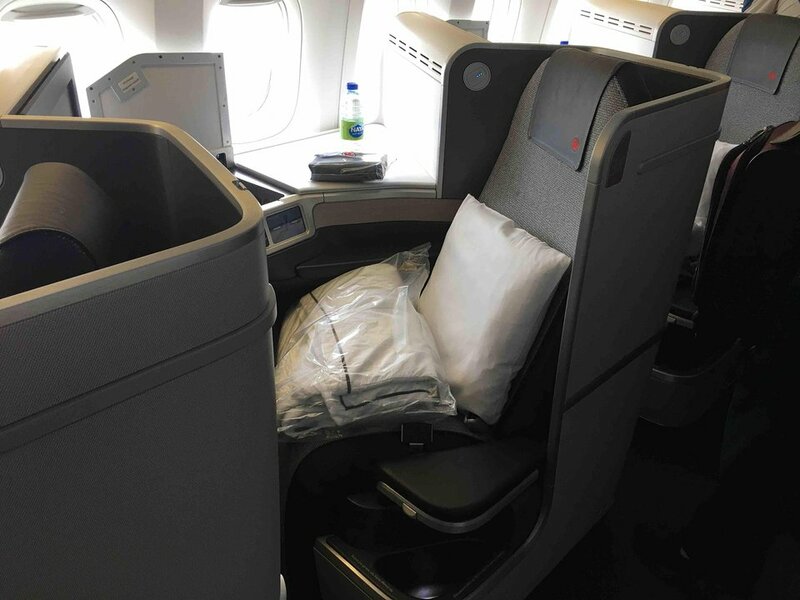 Air Canada have revamped their pods in business class and the result is not good. They are narrower than before and taper very abruptly at the end, which means your feet are crammed together uncomfortably. I got very little sleep and had little luck distracting myself with the inflight entertainment,which now appears to be little more than an afterthought. The music choices were miserably poor: just four or five pieces in each category. On the plus side, the food was much better than a year ago. Recline on side seats in last row of Premium Economy have limited recline due to the class separation behind. When the front row passengers is fully reclined this makes the feeling quite claustrophobic and causes misaligned IFE screen view. Very limited storage space for personal belongings on premium seats.